On a sunny Thursday in the peak of summer, a solitary woman bearing an ice-box, walks purposefully on a narrow road adjoining the Thar desert. There isn't a person or hut in sight. This is Rani, an Auxiliary Nurse Midwife (ANM), on her way to the Village Health and Nutrition Day (VHND) in a far-flung hamlet with a population of just 50 people, including two children who need to be immunized. Across rural India, the monthly VHND is when ANMs like Rani administer routine immunization, in rain and shine. In their first two years, each child is to receive over 20 vaccine shots as per the National Immunization Schedule. It is also a costly exercise. Immunization costs are financed by the Government. Each Measles-Rubella vaccine dose alone costs .50 USD. For context, close to 25 million children are born in India each year. There are 198,356 (GOI data, March 2017) ANMs carrying out approximately 600,000 VHNDs each month, in the country. How do adequate vaccines reach these women in every corner on time with appropriate quality each time? Let's find out. Indian vaccine manufacturers have made a name for themselves by producing quality vaccines at a fraction of the cost incurred by global majors. Today, they produce a third of the world's vaccines and account for 60% of vaccines supplied to UNICEF. While production was initially driven by the public sector, over time, private players such as Serum Institute and Bharat Biotech have made a large contribution. Vaccines require careful management during the delivery process (cold-chain) from factory to frontline. Many vaccines are sensitive to factors such as heat and light and will have to be maintained accordingly. Most vaccines are to be stored between 2 and 8 degree Celsius while some others are to be stored between -25 and -15 degree Celsius throughout the process. Some are light-sensitive. If proper conditions are not maintained, they may lose their potency and could even have severe adverse effects, ranging up to death. Vaccines once produced are transported to any of the four Government Medical Store Depots (GMSDs) located in Karnal, Mumbai, Kolkata and Chennai. From there, they are transported by refrigerated / insulated vans to state stores. 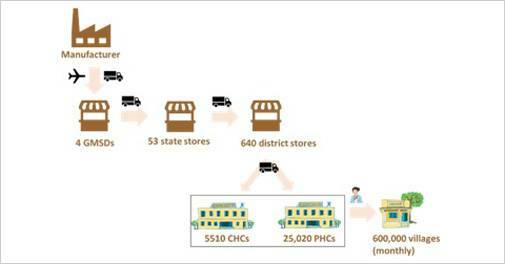 Then, vaccines are transported to district stores (Rs 640) and finally to Rs 5510 Community Health Centres (CHCs, covering a population of 80,000 to 120,000) / Rs 25,020 Primary Health Centres (PHCs, covering a population of 20,000 to 30,000) where they are stored in ice-lined refrigerators (ILRs). Vaccines are stored in layers at various temperature levels based on their optimal requirement. As an aside, cold-chain operators use an interesting mnemonic to help cold-chain supervisors remember the order of layering - Oh (Oral Poliovirus Vaccine) Mere (Measles) Bhagwan (Bacillus Calmette-Guerin), Teri (Tetanus Toxoid Vaccine), Daya (DPT), Permanent (Pentavalent), Ho (Hepatitis). Last-mile delivery is particularly sensitive. From the PHCs, ANMs like Rani transport vaccines to the immunization site i.e. the Anganwadi Centre (AWCs). Distance covered is as high as 20 km. In the final stretch, ANMs place vaccines in make-shift carriers with four ice-packs. This ice-pack based system can keep vaccines usable for about six hours. It is possible for vaccines requiring storage at different temperatures to be stored in the same carrier. 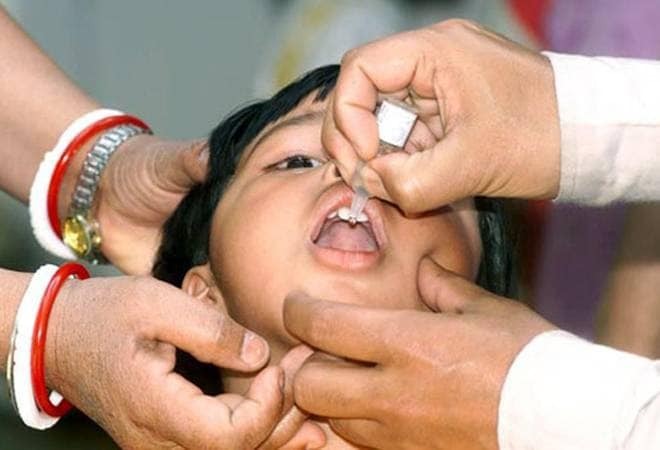 Despite various challenges, immunization is indeed one of modern India's great public health success stories. Since the turn of the millennium, immunization coverage has increased rapidly (see figure). Recently, Mission Indradhanush, launched in December 2014, received acclaim from Johns Hopkins University. In 2017, the Prime Minister made a bold call for achievement of 90% immunization coverage for seven preventable diseases by 2018 itself. Much of the credit for these achievements goes to courageous women like Rani. At the same time, delivery at such a humungous scale is not possible without a large public health system that 'works'. The 'supply side' is doing a good job but work remains to be done. It's time we paid more attention to addressing societal barriers that discourage communities from accessing immunization services. In my work in Northern India, I have encountered tribes who resist vaccination efforts. Even in states like Tamil Nadu with strong health outcomes, parents protested compulsory administration of Measles-Rubella vaccinations. There are divisive undertones. The social media fake-news industry routinely circulates stories claiming that vaccines could put children's lives at stake. Opposition is often driven by bona-fide experts - paediatricians, biostatisticians, healthcare professionals, social groups. This is not restricted to India. In 1998 the Measles, Mumps and Rubella (MMR) vaccine faced opposition in the U.K. based on a paper by Dr. Andrew Wakefield linking it to autism. Wakefield's claims were ultimately debunked. That said, the intentions of these experts cannot be faulted, and they are better qualified than me to address technical concerns. In summary, immunization is a real example of a productive public-private partnership. Private enterprise has spurred vaccine production and made it affordable. And this kind of 'scale' cannot be achieved without the government system. It also goes to show that when the Government displays political will, the sky is the limit. Here's hoping that coverage can be further advanced with a renewed push from the system with the active participation of the community.